The town of Matosinhos, which is located on Atlantic coast, and joined to Porto, is known for a few different things. The beach, the colossal sculpture based on a fishing net, its excellent (apparently – I barely swim) surfing, some luxury apartments, the avant-garde cruise-ship passenger terminal, the docks; and its picturesque side streets. 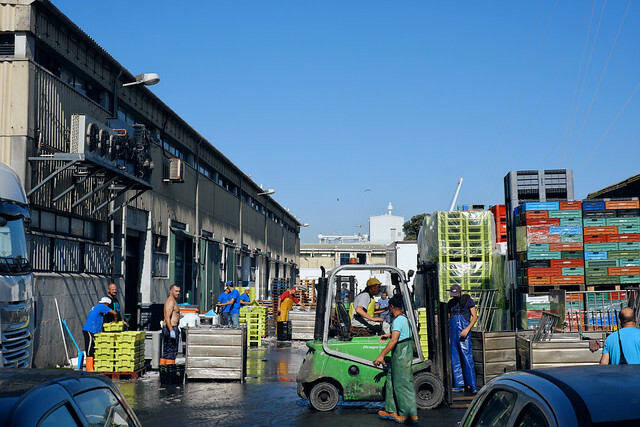 Historically a fishing port, Matosinhos is also known for its seafood restaurants, and it has a famous fish market, where you can buy fish that has just been taken off the boat. As I enjoy markets for the many street, documentary and reportage scenes they offer, this location seemed like an ideal place for me to visit. Finding myself with a few spare hours and my camera, I set off. The thing was.. I wasn’t entirely sure exactly where it was… But being lost with a camera is, by and large – for me at least, a very happy place to be and not lost at all! It didn’t take me long to find a vast building, clearly dealing with crates of freshly caught fish – so out came the camera and in I went. This was a commercial property, a business unit. This was the hub where fishing boats are unloaded, and the catch is processed for distribution to the retail outlets. Look at the shot above. How many workers can you see? Now imagine EVERY SINGLE ONE OF THEM, stopping what they’re doing, and turning to stare, turning to stare at YOU standing there slightly bemused and holding a camera. With street photography, there are rules, there are laws and there are your own moral guidelines to follow. …A mistake that might have seen me get into all types of hot water. I sheepishly put down the camera, and flashed my best ‘ops my bad‘ disarming smile, and I headed for the exit, actually noticing the security guard on the gate this time (who didn’t stop my passage in either direction to be fair). I kept walking and found the actual consumer fish market. And well I have to say – it was a bit of a damp squib in comparison to the real, live, working fish sorting premises. So now my mind was again filled with what could of been.. And I wonder if there’s a way to get permission to go in there, to be allowed to wander around, documenting behind the scenes of the famous Matosinhos fish trade. But the take away for me, try and pay a bit more attention… an open gateway is not an open invitation, however innocent your intentions are. To be fair… The max they could do was to ask you to leave. Fish people, despise being “rude”, are very friendly! I know, cause my dad’s family is or was intirey composed by fisherman. Ha – a sign of the times I am afraid. It’s a funny old world; here in Oman I usually get a very friendly welcome and quite often an invitation for coffee & dates. As long as I have included as many children as I can in an image, which is not what I want. The advantage of a digital camera is that I take these pictures, show them on the back screen – everyone happy and then I use my film camera. Thanks very much. The X-Pro2 Monochrome shots start life as Acros SOOC jpegs, I shoot with -2 highlight and -2 shadow tone, which makes a very flat image. Then in post, I add contrast with the black level slider and the tone curve.